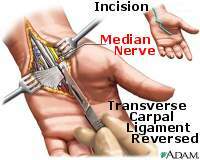 Carpal tunnel syndrome occurs when the median nerve, which runs from the forearm into the hand, becomes pressed or squeezed at the wrist. The median nerve controls sensations to the palm side of the thumb and fingers (although not the little finger), as well as impulses to some small muscles in the hand that allow the fingers and thumb to move. 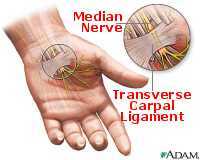 The carpal tunnel - a narrow, rigid passageway of ligament and bones at the base of the hand ¾ houses the median nerve and tendons. Sometimes, thickening from irritated tendons or other swelling narrows the tunnel and causes the median nerve to be compressed. The result may be pain, weakness, or numbness in the hand and wrist, radiating up the arm. Although painful sensations may indicate other conditions, carpal tunnel syndrome is the most common and widely known of the entrapment neuropathies in which the body's peripheral nerves are compressed or traumatized.